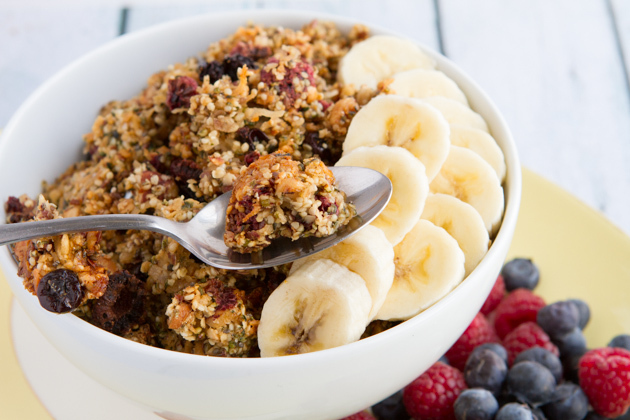 Grain-free granola packed with crisp berries, hemp hearts and coconut. Sweetened with a combination of maple syrup and Energy28 – to deliver supplemental natural energy from whole-food and natural sources. 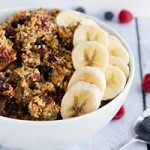 This granola contains 200 calories per bowl and over 7 grams of protein! 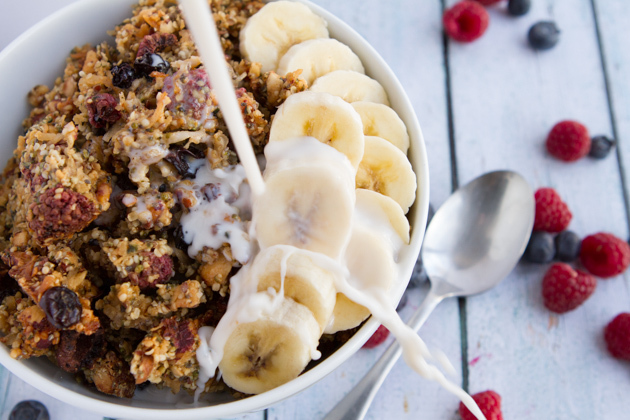 Grain-free granola packed with crisp berries, hemp hearts and coconut. Contains 200 calories per bowl and over 7 grams of protein! 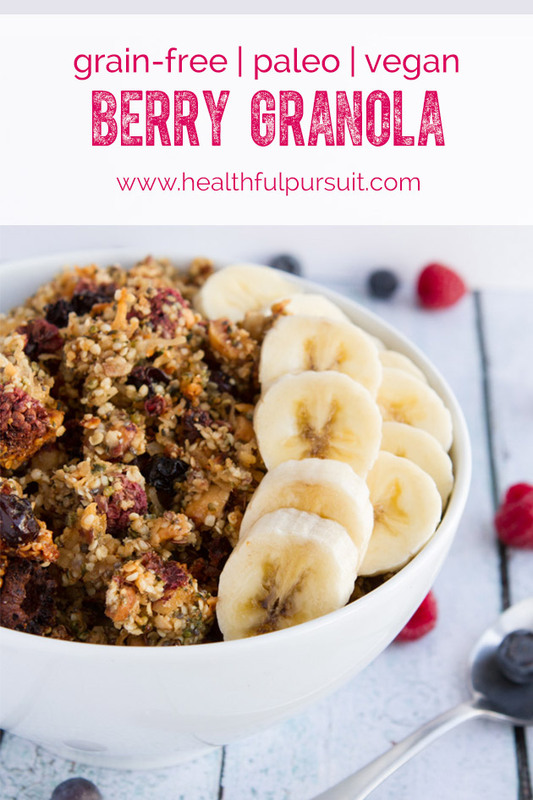 nstead of using dried fruit for this granola (which will increase the amount of sugars), you can try dehydrating the berries at home. If you have a dehydrator, dehydrate 3 cups of a mixture of raspberries and blueberries at 140°F for 12 hours. 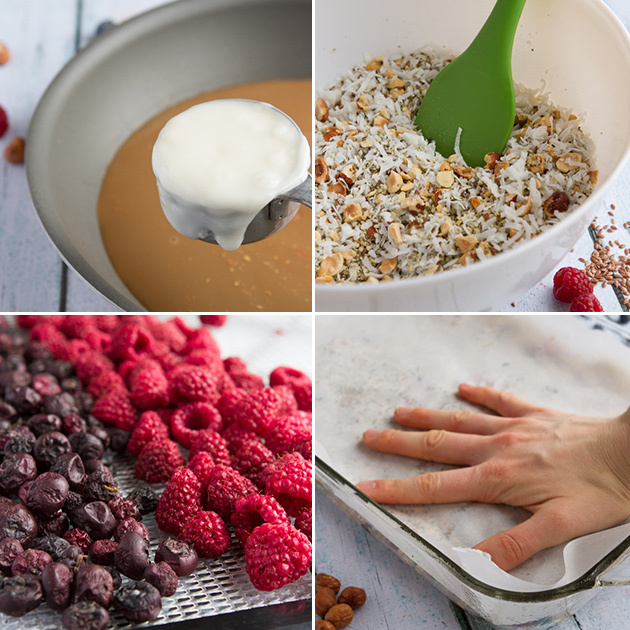 If you do not, you can dehydrate the same amount of berries in the oven by laying them out on a parchment paper– or silicon-lined baking sheet and dehydrating at 180°F for 2 hours. Set aside. Preheat oven to 300°F and lightly oil (with a dab of coconut oil or whatever you have on hand) a 13? x 9? baking dish. Add the hemp hearts, hazelnuts, coconut, chia seeds and flax seeds to a large glass bowl. Set aside. Combine the maple syrup and coconut butter in a medium-sized frying pan. Bring to a boil on medium heat. Do not stop whisking. Reduce heat to low, and whisk for 3 minutes. Pour syrup mixture into the bowl with the nuts and seeds. Mix with a spatula until everything is coated. Transfer mixture to the prepared baking dish. Press mixture firmly into the dish. You can even cover the top with parchment paper and press down with your hand. Make sure it’s very compact (this will make ultra-chunky granola!). Transfer the dish to the oven and bake for 25–30 minutes, until the sides begin to brown lightly. Remove from the oven and leave it to sit for 20 minutes. Then scoop out the pieces (roughly), allowing for large chunks to form. Lay the mixture out onto a large baking sheet and transfer back to the oven for 10–15 minutes. Watch that the mixture doesn’t burn. Remove from the oven and allow to cool completely; add dehydrated berries, then transfer to an airtight container. Can be stored on the counter for a couple of days or in the fridge for a couple of weeks. To reduce the amount of sugar in the granola (every little effort to reduce your overall sugar intake will help in maintaining balanced sugar levels), I dehydrated the berries. And… dehydrated berries are ah-mazing! You could use dried fruit… but dehydrated = so much better! 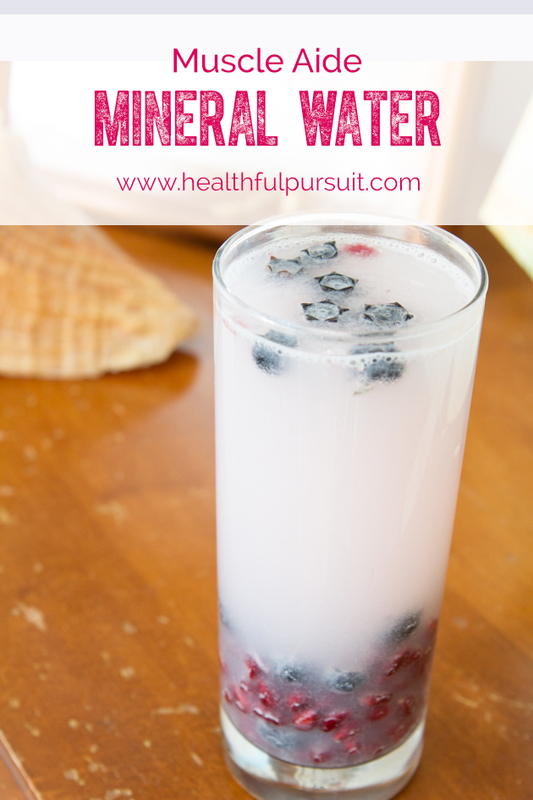 I’ve been experimenting with a flavored muscle aide mineral water recipe for us! This water is packed with the minerals your body needs to relax each and every single muscle. I like drinking it before a yin yoga class (where we hold stretches for long periods of time) to encourage my muscles to let go and stretch out nicely. Does the trick every time! This recipe is a natural approach to flavor-infused mineral water. 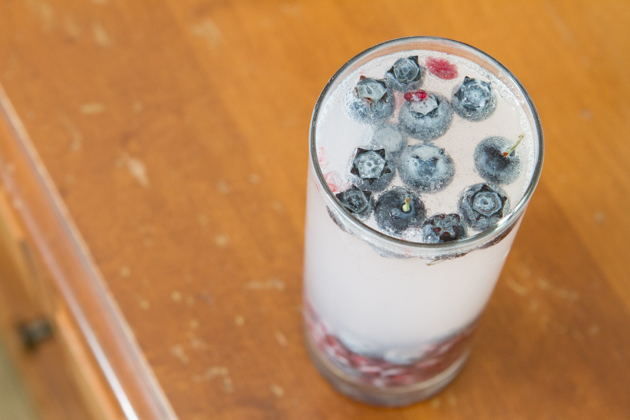 Not only is this drink free of artificial colors or flavors, the Natural CALM used in this recipe, will aide in muscle recovery. When ready to enjoy, drop in a packet of Natural CALM and stir to mix. Enjoy! Do you struggle with maintaining energy throughout the day? Do you find that this energy struggle impacts how you live out your daily life? What physical activities do you treat your body to daily?